The coverings show is this month in Las Vegas so I thought a short Preview was in order. This year we will be showing the UNIMAX VNT. This is our latest machine loaded with the newest technology. The VNT System allows full slabs to be fabricated into finished pieces ready to install. 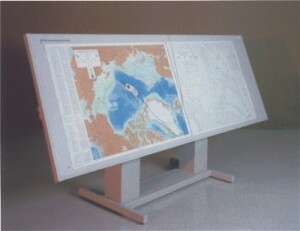 It is a complete single machine solution. You can preview the VNT System in this short video. The VNT technology was a big hit at the last show and seems very well received by the industry. This new technology will make it possible to run a true single machine shop. The ultimate setup with this new technology is the UNIMAX VNT. A full 5 axis machine with a 12” blade. It’s a CNC Saw and a CNC machine in one. I have included some Video links to show you exactly how this works. The above are headlines from an Itialian newspaper outlining the construction of our new plant in Italy. The full article is available here. Waterjet manufacturers Tecnocut S.p.A. of Bergamo, Italy, and Jet Edge, Inc., of St. Michael, Minn., USA, today announced a strategic research and development partnership designed to strengthen both companies’ position in the waterjet industry. Through this unique partnership, Tecnocut will share its innovative IKC 5-axis waterjet cutting technology with taper control with Jet Edge. In exchange, Jet Edge will share its 90,000 psi (6,200 bar) waterjet intensifier pump technology with Tecnocut. The companies also have agreed to partner on a number of innovative research and development projects related to waterjet pump design, multi-axis cutting and robotics. "This is a win-win for both of our companies," said Jude Lague, Jet Edge president. "It gives Jet Edge the ability to meet the rapidly increasing demand for 5-axis waterjet cutting and taper control, and it gives Tecnocut the ability to meet the growing demand for X-Stream cutting pressure." Tecnocut President Stefano Dal Lago shared Mr. Lague’s sentiments. "Working together, while maintaining our independence, Tecnocut and Jet Edge will be much more competitive players in the waterjet industry. We are now both able to deliver the latest technologies found in waterjet systems: 5 axis, taper control and 6,200 bar cutting for increased productivity and lower operating costs, while we work together to rapidly develop the innovative waterjet products of the future for our customers." Tecnocut, founded in 1992, very quickly became one of the most authoritative references in the waterjet cutting technology field. In 2005, it became part of CMS Industries, a SCM Group company, worldwide leader in the manufacture of numerical control machines for processing wood, advanced materials, marble and glass. Thus Tecnocut guarantees its presence in 120 countries and an increasingly articulated solution to different production requirements. Moreover its presence in AIW (Associazione Italiana Waterjet), of which it is a founder member, and WJTA (American Waterjet Association), of which it is a member, represents a guarantee of constant updating for Tecnocut. Established in 1984, Jet Edge is a global designer and manufacturer of waterjet systems for precision cutting, surface preparation and coating removal. Jet Edge systems are used around the world in a broad range of industries, from the world’s leading airlines to automotive, aerospace, industrial manufacturers, machine and job shops. Jet Edge waterjet systems are proudly made in the U.S.A.
Congratulations to Mario Sardo, owner of Fordham Marble. 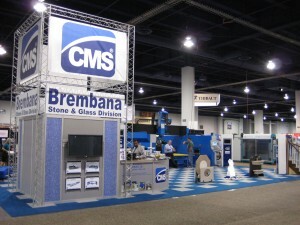 Mario bought the first BREMBANA ever in the United States, which also happened to be the first CNC machine specifically designed for stone sold in the US. This year at StonExpo Mario won a Pinnacle award for his and hers baths done in Onyx. Mario has promised to send me photos of the work that won him the Pinnacle award and I’ll post them as soon as i receive them. 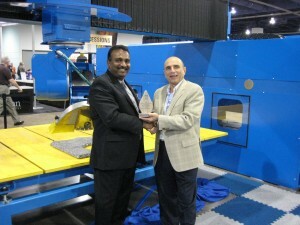 Saba Vasanthan (CMSNA Product Manager) congratulates Mario Sardo on winning a Pinnacle Award. 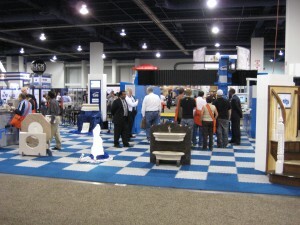 I was surprised that this years StonExpo seemed very good. There was good attendance given the current economic climate. The quality of attendees was also high. Serious people asking serious questions about equipment. All in all I thought the show was very favorable. We were showing the Sprint CNC Saw.